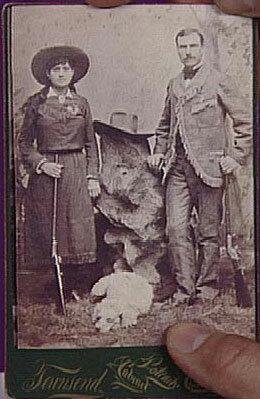 Immediately after Annie Mosey, better known as Annie Oakley now, bested Frank Butler in their first shooting contest, Frank began courting her. Annie had been raised in a Quaker home and was possibly a little shy about affairs of the heart, so Frank enlisted the help of his trained poodle, George. Previously, George’s biggest job had been to balance an apple on his head so Frank could shoot it off, but George, managed to charm Annie before Frank had to town leave with the circus. For the next year or two—the Butlers were always ambiguous about their wedding date— “George” sent Annie letters and gifts from the road. Annie’s family approved of kind, clean-living Frank Butler, and the couple’s shared love of shooting and hunting made them an excellent match. Frank must have felt he took home the real prize from the Greenville shootout when Annie married him.